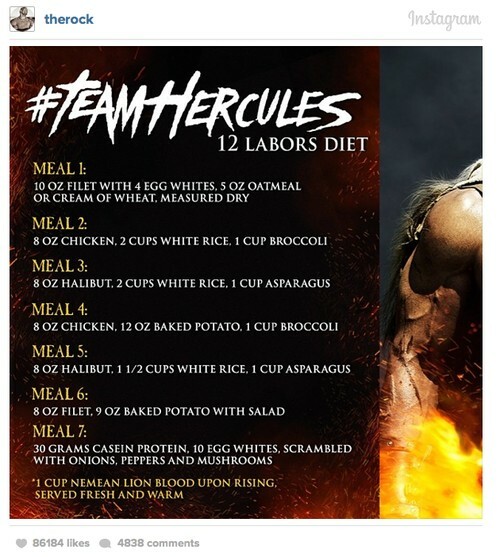 Dwayne Johnsons aka The Rock reveals his team Hercules diet plan. He recently had to get into the best shape of his life (you would’ve though he was already there) for the role of “Hercules” and he wanted to share with all his instagram followers what his intense diet regimen consisted of to get there. The ordinary person would eat 3 meals a day, including a couple of snacks. but if you want to pack on some lean mean muscle you need you need to add a whole lot more to your meals. The rock revealed he had to eat seven times a day, and it wasn’t including snack it was seven meals a day. Each meal consisted of either chicken, fish, protein powder, and egg whites. Along with rice, potatoes or oatmeal for carbohydrates and broccoli or asparagus seems to be his veggie of choice. Dwayne explained this was no fad diet. He had to commit to this particular food plan for 22 weeks. His 14 egg whites a day, and over 3 pounds of lean meat helped him really turn in to the greek God Hercules. * lol at the 1 cup of Lions Blood.